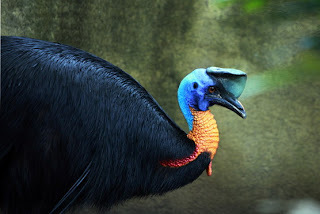 Animal Wildlife | Cassowary | The cassowary is a large species of flight-less bird, that is natively found in the forests of Papua New Guinea and on it's surrounding islands. 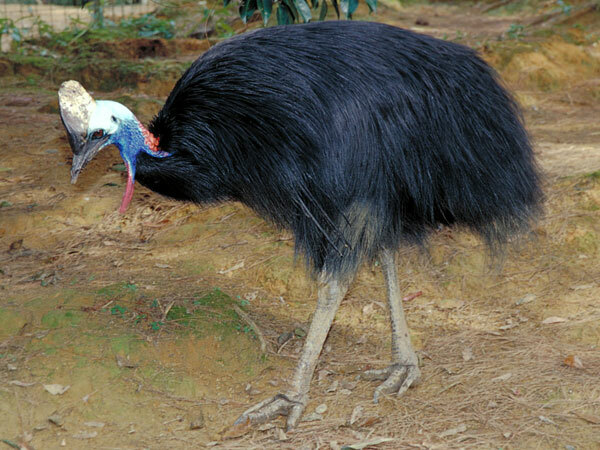 The cassowary is closely related to other large flight-less birds including emus and ostriches and is the third tallest and second heaviest bird in the world behind these two. The cassowary inhabits dense tropical forest on New Guinea and it's surrounding islands and parts of north-eastern Australia. There are three species of cassowary which are the Southern Cassowary or Double-wattled Cassowary, found in southern New Guinea, northeastern Australia, and the Aru Islands, the Dwarf Cassowary or Bennett's Cassowary, found in New Guinea, New Britain, and on Yapen, and the Northern Cassowary or Single-wattled Cassowary, found in northern and western New Guinea, and Yapen. 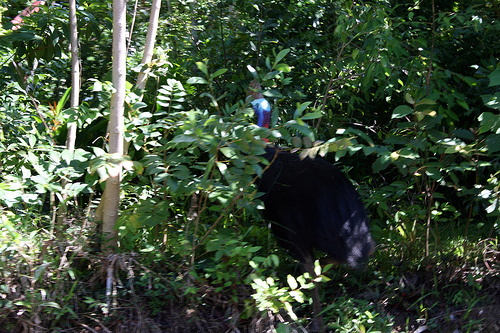 The cassowary has adapted well to a peaceful life in the depths of the forest and as a result, are rarely seen by humans who are trying to spot them. The cassowary cannot fly and so has developed the need to run and incredibly fast, as these large birds are able to sprint through the jungle at speeds of more than 30mph. The cassowary also has large, sharp claws which aid the cassowary in defending itself from danger. 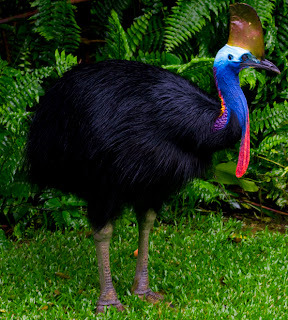 The most distinctive features of the cassowary are it's large body size and brightly coloured feathers (females are both larger and more colourful than their male counterparts), and the large, spongy crest that protrudes from the top of the cassowary's head, which can grow to 18 cm in height. 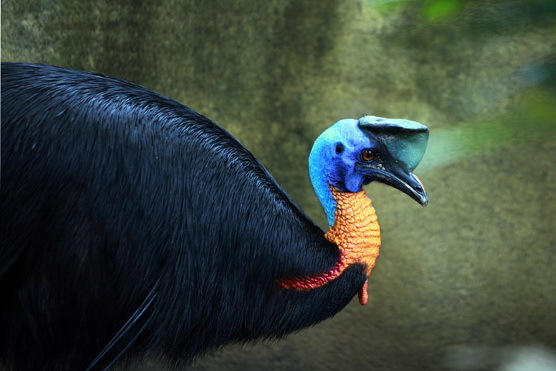 Although not much is really known about the purpose of these crests, it's thought that the crest of cassowary is used to assert sexual dominance, to settle disputes and also helps this bird when it is running through the thick undergrowth. The cassowary is an omnivorous bird and therefore eats a wide variety of both plants and animals in order to gain all the nutrients that it needs to survive. 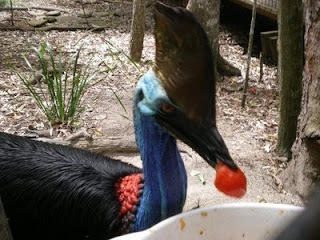 Cassowaries mainly feed on fruits that have fallen to the ground from the trees, along with leaves, grasses, seeds, insects, spiders and other invertebrates. The cassowary has adapted to a life without the need to fly due to the fact that, historically, the cassowary had no predators within it's natural environment and therefore had no need to flee. However, with human settles can mammalian predators including dogs, foxes and cats that mainly destroy the vulnerable nests of the cassowary, eating their eggs. 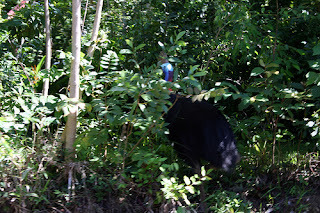 The cassowary breeding season is thought to be from May to June when the female cassowary lays up to 8 large, dark eggs into a nest on the ground made from leaf litter. However, the female cassowary then leaves her eggs to be incubated by the male who fiercely guards his future brood from predators for up to 50 days when the cassowary chicks hatch out of their shells. 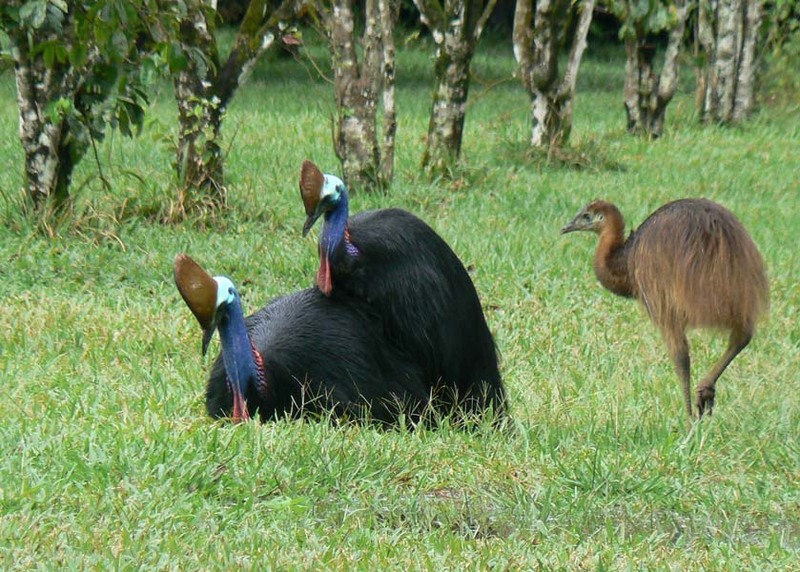 Today, mainly due to deforestation and therefore habitat loss and the introduction of predators to the cassowary's native islands, all three cassowary species are at risk in the wild and are classified as vulnerable animals.